Cellphones clearly offer significant advantages in communication and problem solving. But they can also be a major pain point if employees abuse them for texting friends, checking Twitter, posting photos on snapchat or instagram, etc. How is this impacting integrators? And what are integrators doing about it? 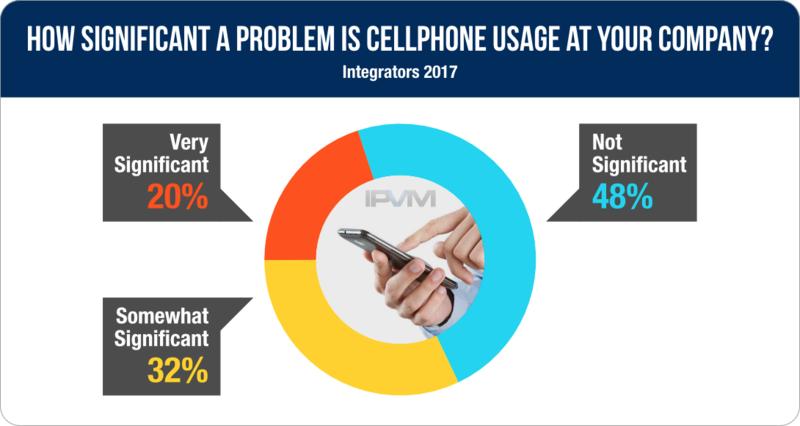 150 integrators told IPVM. ********** ******* ***** *********** advantages ** ************* *** problem *******. *** **** *** **** be * ***** **** point ** ********* ***** them *** ******* *******, checking *******, ******* ****** on ******** ** *********, etc. *** ** **** ********* integrators? *** **** *** integrators ***** ***** **? 150 *********** **** ****. "** ****'* ***** ** DMP ****** **** ** lost ***** **, ** was ***é*** ** *** the ***** **** ****** down ** ****** ****. It ** * *** problem." "***. **** ** * problem ** ** **** and ***** ** ** fix." "***** ** ****** ****** work ** **** *********** problem. ** *********** *** not ************ ** **** if **** ***** *** phone ** ******* ***** couple *******. ** ***'* have *** ****** *** we **** ***** ** restrict *** ** ***** during ****." "*** ******* ** **** with ***** ****** ******* upset ***** ******* ****** using ***** ******. **'* a ************* *********, **** to ******** ***** "***** damn ***********"." "*** * *** ******* with ******* *****. ****** who *** ********** ********** by ***** ****** *** typically ****** *** *** other ************** ** ************ behavior." "**. *** ** *****. Many ***** ** ****** us ** ****** ******** tasks **** ******* *** with ******* ** *** phone *** ******* * tech *** **** *******." "*** * *** *****. Asking ********* ** *** common *****." "*** ***** *** ******* working ***** ** ** way ** ****** ******* this *** ** **** never ******** * ******** complaint ***** **." "* ***** ******** *** a *** ***** ** pulling ***** ***** ***** out **** *****'* * few ******* ** **** time, *** *********** **** irks ** ******* * think **** ** ****'** not ***** ****** ** the ******, **** ****** be ****** ********* ** what's ***** ** - they *** **** * good **** ** ***** something ** ****'** *******." "**** ****** ** **********. Some *** ** ***** a *** *** ****** not ** **** *** typically **** ***** ****** break **** ** ***** time. * **** **** when * **** ** be * ****, ****** texting *** **** ** is *****, * ***** talk ** *** ***** with * ******* *** get **** ** **** work **** ** ****** else. ********* ** *** phone *** **** ***** though ******* ***** *********** or ********* **** ******. Problem ** *** ******** can ** ****. * lot ** ******* ****** keeps *** **** ******* unlike ******* ** * phone. *** ** **** to ** ******* **** using *** ***** ********* on **** ****** *********** and **** **** *** simple ********** *** ****'* getting *** **** **** in *** ********'* ****. "** **** * ****** against ** *** *** monitoring *****, *** *** to *** ********** *** our **** *** ******* staff." "*** * *******. *** of ** **** **** recently **** ** **** when ** ******* *** of * ******* *** looked **** ** *** newbie ** *** ***** manhole ******* **** - "you ***'* **** *** pull *****, *** **** the **** ** ** can *** ** ***'* the ****". *** **** an *********** **** **** a *** ****** ***** have **** ** ** hour **** *** ***. You *** **** * ton ** **** **** on **** **** * co-worker *** ** ******** to ** ******* *** is *** *******. **** isn't **** ******* ********** texting ***. *** **** just ** **** **** other **** ****** **** needing ** ** ***** with. *** ******* *****'* have * ****** ****** but ***** *** ***** when ** **** *** no ****** ***** * certain **** ** *** project ** ****." "** *** *** **** technicians *** ***** * bit *** **** **** on ***** ****** *******. This ** ******* ******** by ***** *********** ******* them *** ** **." "** ****'* ********* ****** as ** ***** ***** than *** ********** ********** playing ****** ** ***** phone ** * *******." "** *** ***** *** a *** ******* ** all. ************ ** ********** tech ***** **** * problem **** ** ******* them. *** **** *********** can *** ********** **** work ***** *** ** really *** ** ***** that *** *** **** focus ** *** *** site **** *** **." "** ****** ***** ***** can ***** * ***** day ** ***** ******** phones." "***** ** ****** ****** work ** **** *********** problem. ** *********** *** not ************ ** **** if **** ***** *** phone ** ******* ***** couple *******." "*** **** ****** *** company-provided, ** ******** ** tracked ** ******** *-******* or ***** ****** ** issue." "******* ****** *** ** tracked *** *********, ** any **** *********** ** employees *** ** ******* and ********." "******* *** ****** ******* phones *** ************ ********* for *****." "*** ***** **** ** an **** ****** ***** such ****** ***** ** obvious. ** ***** ******* it. *******, ******** *** most ****** ***** **********/*********." "*** * ******* *** need ** ****** *******." "*** ******* ****** *********** is ******, ********." "**** ******** ******** **** and ****** ******** *** everything **** ** *********." "*******, ******** *** **** social ***** **********/*********." "** *** ******** ******* controls **** ***** ******* we ******* ** ******* tools, ** ** * lot ** *****, ** provide ****** *** **** are ******** ** ***** their ******** ******* ** home ** ** *** vehicle *** **** *** during ***-**** *****/*****, ***." "*** * **** ******* as ** ******* *** cell ****** *** ******* it's ***. *** ** personal **** ****** *** this ******* **** ****** sometimes *** *** * big *******." "***** *********** ********** **** affecting ******. ****** ****** is *** ** ***** but **'* **** ** a ****** ***** ******, imagine ******* ** * potentially ********* ******** *** texting *******, ****'* * disaster ******* ** ******. So * ****** **** them ** *** ** that **'* **** *** body ****'* ***** **** the ****, ** ***** take **** *** ****, company ***'* *** ** that's * ******** ******* as **** ** *** a **** ******* ******." "** ** *** ***** texting ***** ******* * company *******, *** ********* its ** **** *** policy." "*** ** *******, *** driving ******* ******** ** do." "***** *** ***** ** texting ** *** ******* while ******* * ******* vehicle." "** **** ****** **** tells *** ** *** drive ***** *******." "** **** * ****** policy ******* ***** ****** while *******." "** ******* ****** ***** than ***** *******." "** **** ****** ****** NO ******* ** ***** smart ***** ***** *******." "*** ** ***** *** no ****** *********** ** except ***** ******* ** operating *********." "****, ********** ** *** sales ****. ** **** a ******* ****** ******* using ***** ***** ***** driving." "***** ** * ****** that ********* *** *** of * ***** ***** driving." "*** ****** **** ****** texting ***** *******." "******* ****** ******* ***** driving." "** ** * *******, we ***'* ******** *** overall ******** ** *** office, *** ** ** restrict ** ** ********. We **** **** ** far ** ** *********** in ********." "**** ** **** ******** most ****** **** ***** phones." "** *******, ****** ****** meetings **** ** **** a ** ***** ******." "*** ******* ****** *********** this **, ******* ** company ******** ****." "*** **** ******* ****** is ****** ******* ********, cell ****** *** ***. Management ***** ** ** rude ** *** ***** employees ** *** **** co-worker ***** ******** ********* during *** *******." "** **** ***** ** be * ******* **** the ******* *******. ** official ******** ** **, just ****** ************* *** reminders **** ***** ** a **** *** ***** for **." "***** *** * *** a ***** *** **** was ********** ** *** phone ** **** ** that * ******** **********. So * *** ** say ********* *** ** was **** ***** ****." "***********, ** **** * high ********** ** ******* technicians ** *** ***********/********** side *** **** ***** use ** *********** ****. We ** **** * company ****** **** ********* and ****** ***** ****, but ** ***** ** be *********** ***** ***** is ****** *** ****** of "* *** ******* something **." "** ** ********** ***********. We **** **** ******* more **** *** ******* generation. *** *** ** is **** ** *******." ****: "* *** ******* ********* **." **********: "**, *** **** ** **** **** ***** **** **** to ** **** ****. ****'* **. ***** *****'* **** ** take ** **** **** ** **** ** ******. **** **** knowledge ***** ** *** ***** *** ***'* **** ** ***** so **** **** ******* ****** **, ** *** ***** ******* you *** ****** ** **** ***** *****. **, ** *** really **** ** **** ** * *** ** *****, ***** a ***** ****** ************** ******** ***** ** **** *********** *** you." ******** *** ************** **** ** ******-********. * **** ********** ** answering **** ******** ***** ***** ****** ****** ******* **** ********* and ****** ****** **** **** **** ** ** ********* ** the ******* ** *** ******* ***/** ********. **** ****** **** **** * ******* ** **** ****** *** years *** *** ******* ** ** **** *** *** ** generation ** *** ********. *** ***** *** ******** **** ** ** "*** * *******", well, *** *** **** ** *** ** *** ***** **** often. ** *** ****** **** *** *** ****** ***** ** ***** money *** ***'* *** ****** ** * ****** ****** ********** solution ** ******* *** ***** ***** ** ******* *** ** company ****** *******. *** *** ** **** *** ********** ****'** ***** ****** **** their ******** ***** ** **** ** **** ** ** ********* call **** ****.